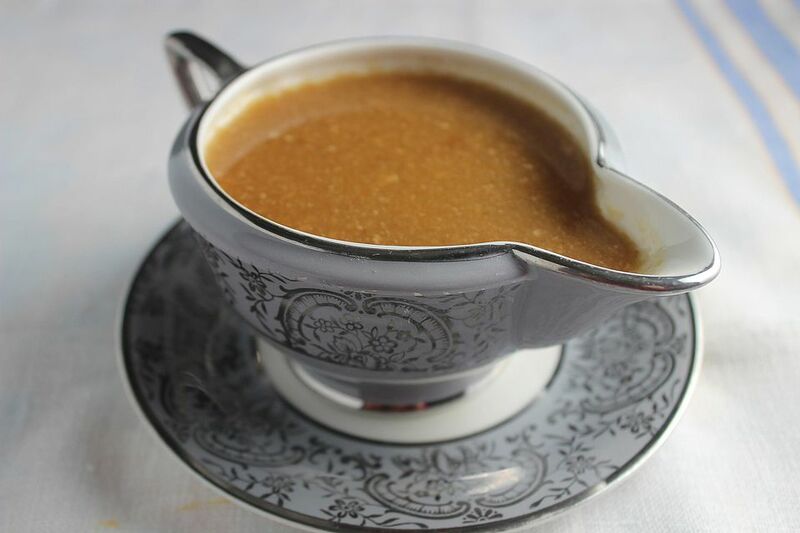 Make the gravy for your Thanksgiving turkey ahead of time, refrigerate it, then reheat with some of the drippings from the turkey roasting pan when you want to eat. Remember, the key to the best gravy is the salt content. Taste the gravy and add salt as needed. You'll know when you've hit the right amount—all of a sudden the gravy will take on a wonderful meaty flavor. There's nothing like having gravy made ahead of time. Gravy can be tricky to make, and having that chore taken care of will help a great deal when you're running around getting the meal ready. In​ a large saucepan, combine the chicken broth, onion, and chicken bouillon. Bring to a boil, reduce heat, and simmer until mixture is reduced to four cups, about 30 to 45 minutes. When broth is almost reduced to the correct amount, combine the flour and butter in a separate saucepan. Cook and stir over low heat until flour begins to take on a bit of color and turns tan. Strain the chicken broth into the pan with the flour mixture, stirring with a wire whisk. Bring to a boil, stirring constantly. Pour into containers, cover, and chill for up to 6 days. When ready to eat, scrape some drippings and fat from the turkey pan into a saucepan and pour in the gravy. Heat until simmering. Taste the gravy. If it tastes flat, add more salt, a bit at a time, until the gravy tastes rich and meaty.